ABOUT CHOOSING THE RIGHT MEMORIAL. Certain memorials can sometimes evoke a feeling of sentimentally or can resonate with a customer and in doing so they can identity with the sculpted memorial in all it's glorious craftsmanship. 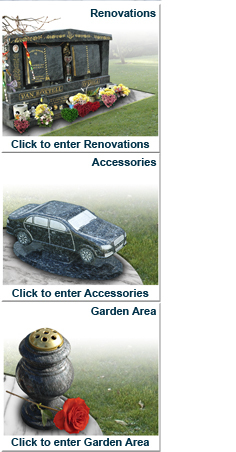 Tallaght Headstones and Memorials have a selection of the most striking and skillfully crafted headstones to personify the memory of your loved one. A respectful and dignified tribute that will forever stand the test of time and always be there as a sacred place to reflect and lament. Our experienced and knowledgeable staff can also advise you on the various cemetery regulations which apply as to the type of memorials and size of memorials that are permitted and of any charges payable to the cemetery authorities. 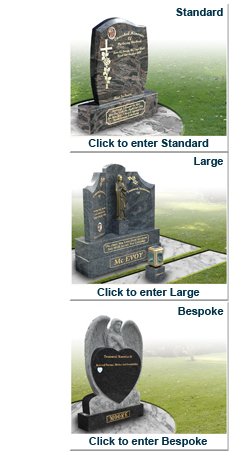 We can also provide advice on the wording on the final inscription and assist you on choosing an appropriate design incorporated in your memorial to reflect the life and achievements of your loved one. Photographic representations of the deceased can be etched onto the memorials or ceramics. Photos can be attached to the memorial or on any sundry.